Both the American persimmon (Diospyros virginiana) and the Oriental persimmon (Diospyros kaki) trees need male and female flowers to produce fruit. Although some trees have both male and female flowers, this is not common. In most cases, for your female persimmon tree to bloom and produce fruit, there must be a male tree nearby. Trees that are either male or female are called dioecious. For the most part, persimmons are dioecious. The male trees produce flowers that produce pollen and the female trees, once pollinated, produce the fruit. Occasionally, male trees will produce bisexual flowers, which will in turn produce atypical fruit. Some cultivars may change from year to year -- one year they may require pollination, and the next they may be able to self-pollinate. Cultivars that self-pollinate are called parthenocarpic, and they may produce seedless fruit without being pollinated. This is more common in Oriental than American varieties, although "Meader" is a well-known American persimmon that does self-pollinate. If parthenocarpic cultivars are pollinated, they will produce fruit that has seeds. Although the fruit may have a different flavor and texture from the seedless variety the tree normally produces, this is usually a good thing. Oriental persimmon parthenocarpic cultivars in particular produce greater quantities of larger fruit when pollinated, according to the National Gardening Association. The primary pollinator of persimmons is the honeybee, which does not usually travel more than a mile or two from its colony. Both Oriental and American persimmons usually take several years to bloom. It can be difficult to tell if your persimmon tree is male or female, but the flowers will give it away. All persimmons produce small, yellowish-green, bell-shaped flowers, but male flowers grow in clusters of three, and they are often tinged with pink. Female flowers grow singly. Both male and female flowers grow on short stalks, with the male flowers being slightly shorter -- about 1/3 inch -- in length than the almost-1-inch-long female flowers. In addition, female flowers are framed by calyxes, which look somewhat like miniature leaves. In male flowers, the calyxes are so small as to almost be indistinguishable. American and Oriental persimmons have similar cultural needs, although the former are a bit less picky. They both thrive in moist but well-draining soil that is on the acidic side, and in full sunlight. American persimmons will also bloom in partial shade. Plant male and female trees about 20 feet from each other, and at least 12 feet from any nearby structures. All persimmon trees require a slight chilling period. Oriental persimmons, which are native to China, grow best in U.S. Department of Agriculture plant hardiness zones 7 through 10, as they only have a chilling requirement of about 100 hours. American persimmons are more cold-hardy, and thrive in USDA zones 4 through 8a. Even if your persimmon cultivar is self-pollinating, it will benefit from pollination, and this is true of both American and Oriental persimmons. If your female tree is an Oriental cultivar, and you want to plant a male tree nearby, "Galley" and "Gosho" are good Oriental choices, according to the National Gardening Association. For American persimmons, the best choice is "American Male." 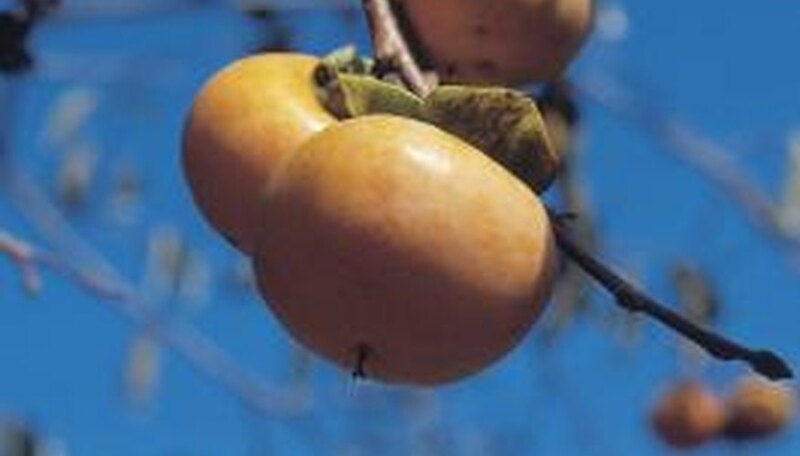 Purdue Plant & Pest Diagnostic Library: Persimmon -- No Fruit?